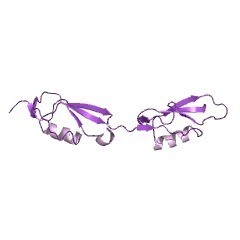 The PASTA domain (for penicillin-binding protein and serine/threonine kinase associated domain) is an extracellular module of ~70 residues that is found in the C-termini of eukaryotic-like serine/threonine kinases (PSTKs) and high molecular weight penicilin-binding proteins (PBPs). The PASTA domain is distributed mainly in the GRAM-positive bacteria, most notably among species of the genera Bacillus and Clostridia. It is not found in eukaryotes. The PASTA domain occurs both singly and in multiple copies, which suggests that it is a domain rather than a structural repeat. 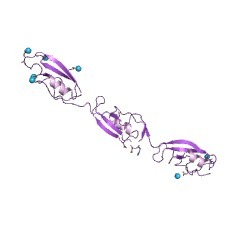 It is found in association with other domains, such as transpeptidase, protein kinase or transglycolase [(PUBMED:12217513)]. The PASTA domain is a small globular fold consisting of three beta strands and an alpha helix, with a loop region of variable length between the first and second beta strands [(PUBMED:12217513), (PUBMED:10860753)]. There are 52097 PASTA domains in 17498 proteins in SMART's nrdb database. Taxonomic distribution of proteins containing PASTA domain. This tree includes only several representative species. The complete taxonomic breakdown of all proteins with PASTA domain is also avaliable. Click on the protein counts, or double click on taxonomic names to display all proteins containing PASTA domain in the selected taxonomic class. 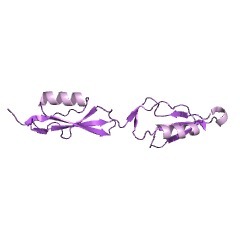 The PASTA domain: a beta-lactam-binding domain. The PASTA domain (for penicillin-binding protein and serine/threonine kinase associated domain) is found in the high molecular weight penicillin-binding proteins and eukaryotic-like serine/threonine kinases of a range of pathogens. We describe this previously uncharacterized domain and infer that it binds beta-lactam antibiotics and their peptidoglycan analogues. We postulate that PknB-like kinases are key regulators of cell-wall biosynthesis. The essential function of these enzymes suggests an additional pathway for the action of beta-lactam antibiotics. 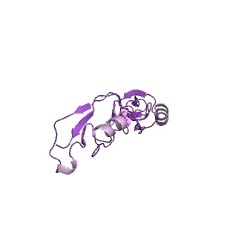 Crystal structure of a deacylation-defective mutant of penicillin-bindingprotein 5 at 2.3-A resolution. Penicillin-binding protein 5 (PBP 5) of Escherichia coli functions as ad-alanine carboxypeptidase, cleaving the C-terminal d-alanine residue fromcell wall peptides. Like all PBPs, PBP 5 forms a covalent acyl-enzymecomplex with beta-lactam antibiotics; however, PBP 5 is distinguished byits high rate of deacylation of the acyl-enzyme complex (t(12)approximately 9 min). 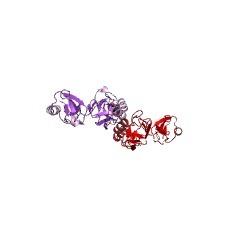 A Gly-105 --> Asp mutation in PBP 5 markedly impairsthis beta-lactamase activity (deacylation), with only minor effects onacylation, and promotes accumulation of a covalent complex with peptidesubstrates. 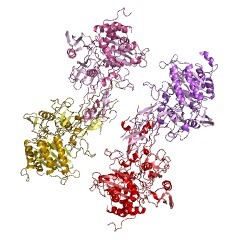 To gain further insight into the catalytic mechanism of PBP 5,we determined the three-dimensional structure of the G105D mutant form ofsoluble PBP 5 (termed sPBP 5') at 2.3 A resolution. The structure iscomposed of two domains, a penicillin binding domain with a strikingsimilarity to Class A beta-lactamases (TEM-1-like) and a domain of unknownfunction. In addition, the penicillin-binding domain contains an activesite loop spatially equivalent to the Omega loop of beta-lactamases. Inbeta-lactamases, the Omega loop contains two amino acids involved incatalyzing deacylation. 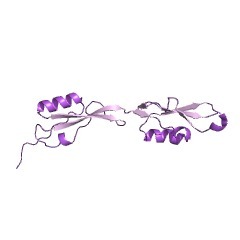 This similarity may explain the highbeta-lactamase activity of wild-type PBP 5. Because of the low rate ofdeacylation of the G105D mutant, visualization of peptide substrates boundto the active site may be possible. This information is based on mapping of SMART genomic protein database to KEGG orthologous groups. Percentage points are related to the number of proteins with PASTA domain which could be assigned to a KEGG orthologous group, and not all proteins containing PASTA domain. Please note that proteins can be included in multiple pathways, ie. the numbers above will not always add up to 100%.